Dutch broadcaster BNNVARA denies that parody of Israel’s winning Eurovision song was anti-Semitic. A Dutch broadcaster denied on Tuesday that a parody of Israel’s winning Eurovision song that aired on a state-funded television show was anti-Semitic, AFP reported. The parody of the song “Toy” by Netta Barzilai aired Sunday on the first edition of a new television show “The Sanne Wallis Show” on the public broadcaster BNNVARA, starring comedienne Sanne Wallis de Vries. The Israeli foreign ministry sent a letter of protest to BNNVARA with a copy to the Dutch foreign ministry over the parody. 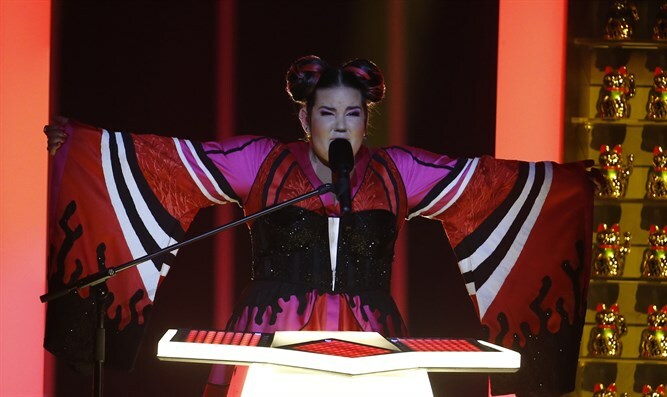 "Showing sad and depressing videos in the backdrop of the Israeli Eurovision winning song was not only in bad taste, but it was wrong and disgraceful," added the letter. BNNVARA later told the NOS Dutch public broadcaster that the parody was not meant to be anti-Semitic. "In the Sanne Wallis show happenings of the past week are discussed in a satirical way," it said. "The parody questions Israel's policies and is in no way an indictment of the Jewish community," added BNNVARA. De Vries declined to comment, the NOS added, while the Dutch foreign ministry could also not be reached for comment. Israel’s victory at Eurovision has prompted calls for a boycott of next year’s contest, which under the accepted protocol will take place in Israel. Iceland’s national broadcaster, meanwhile, last week indicated the country would take part in next year’s Eurovision song contest in Israel despite a popular petition calling to boycott the event.